In Poland, brown coal deposits occur in younger geological formations, mainly of the Tertiary age. Older brown coal deposits are known to occur also in the Jurassic, Carboniferous and rarely - Cretaceous and Triassic. The brown coals are intermediate in the qualification between hard coal and peat. Their characteristics and properties were markedly influenced by the type of the parent plant material and environment in which they originated. Brown coal deposits originated both in platform areas and sedimentary basins in orogenic belts. The coals form the extensive seams from a few meters to several dozen meters in thickness. It also occur in the form of lenses. The thickness of overburden is usually quite small which makes the opencast mining of the deposits possible. Seams of older brown coals are often situated too deep below the surface level for the opencast mining and require the underground mining. This is also the case of coal seams occurring in glacitectonic folds. The methods of the underground mining were lately used in Poland to mine coals in Babina and Sieniawa deposits. There is brown coal deposits occurrying in Poland presented on the map. Brown coal resources are documented with taking into account the following limit values of the parameters that define the deposit (the opencast mining): the maximum depth of deposit base of 350 m, the minimum brown coal layer thickness in bed of 3 m and the maximum overburden/deposit thickness ratio of 12:1. The minimum weighted-average calorific value in a bed (with intercalations) should equal 6.5 MJ/kg (at the brown coal humidity of 50%). These are the basic criteria of geological-mining parameters and qualitative parameters for energy coals which are common in Polish deposits. Poland’s anticipated economic resources of brown coal amounted to 23,385.06 million tonnes as of the end of 2017. The majority of resources constitute energy coals, that is 23,384.42 million tonnes, remaining 0.64 million tonnes are bituminous coals. There were also coals usable for the production of briquettes and coals suitable for the production of coal tar and liquid through a distillation documented in the past. Currently, all these coals are used and treated as energy coals only. Table 1 shows resources and the current state of the exploration and development of brown coal deposits in Poland. Anticipated economic resources within exploited deposits amounted to 1,276.41 million tonnes (5.46% of total anticipated economic resources). 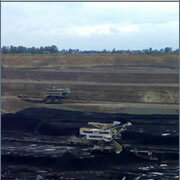 Brown coal is being exploited by five mines: Bełchatów, Turów, Adamów, Konin and Sieniawa. About 16% (3,690 million tonnes) of anticipated economic resources constitute the resources of the deposits within the Poznań through. These are Czempin, Gostyń and Krzywin deposits where potentially strip mining is nowadays precluded on the environmental grounds and in connection with a high class and a value of the agricultural lands. These are the main issues to be solved by the local societies, the ecological organizations and the supporters of the deposits development, before the exploitation starts. It might seriously complicate the deposit development in the future. Table 2 shows basic parameters of non-exploited deposits with anticipated economic resources exceeding 75 million tonnes. Anticipated economic resources of brown coal amounted to 23,385.06 million tonnes in 2017 and decreased by 66.07 million tonnes in comparison with the previous year due to the exploitation and losses. In 2017, there was a new documentation with recalculated resources developed for Koźmin deposit – due to the exploitation end. The remaining resources in the deposit were settled. Economic resources of brown coal as of 31.12.2017 amounted to 992.58 million tonnes. They decreased by 71.99 million tonnes as a result of the exploitation and losses. The brown coal output, according to the data provided by the concession holders, increased in 2017 by 2,787 thousand tonnes (4.62%) in comparison with the previous year and amounted to 63,060 thousand tonnes. The majority of the output came from Bełchatów-pole Szczerców deposit (27,805 thousand tonnes – 44.09% of the domestic production), whereas the exploitation from Bełchatów-pole Bełchatów deposit amounted to 16,734 thousand tonnes (26.54% of the domestic production). The production from other deposits accounts for: Turów – 10.89% of domestic production (6,869 thousand tonnes); Pątnów IV – 7.02% (4,428 thousand tonnes); Adamów – 4.66% (2,939 thousand tonnes), Tomisławice – 3.39% (2,140 thousand tonnes) and Drzewce – 3.27% (2,062 thousand tonnes). The remaining output came from Sieniawa 1 deposit and amounted to 84 thousand tonnes (0.14% of the domestic production). In comparison with 2016 the output increased from 4 deposits: - by 3,870 thousand tonnes (16.17%) from Bełchatów-pole Szczerców deposit; - by 499 thousand tonnes (3.07%) from Bełchatów-pole Bełchatów deposit; - by 490 thousand tonnes (31.17%) from Drzewce deposit; - and by 14 thousand tonnes (20.00%) from Sieniawa 1 deposit. In other deposits the exploitation dropped: - by 759 thousand tonnes (14.63%) from Pątnów IV deposit; - by 664 thousand tonnes (8.81%) from Turów deposit; - by 149 thousand tonnes (6.51%) from Tomisławice deposit; - and by 1 thousand ton (0.03%) from Adamów deposit. Moreover, the exploitation from Koźmin deposit has not been carried out (in 2016 the output amounted to 513 thousand tonnes). The figure shows changes in the resources and production of brown coal in Poland in the years 1989-2017.